Over the last two months I took a break from blogging. In January I had a long term substitute teaching job and was kept busy staying on top of 5 different high school preps. In doing that, I realized what I have probably known for the last 10 years, that I love being a teacher. On the other hand, I truly missed the blog world, the world of repurposing and making something old useful. I'd race home each day after school and immediately sit down and read all of my favorite blogs and dream. A recent job loss has forced me to try to make some money in different ways. I know there are teaching positions in other parts of the country, but I have a son and a husband who are comfortable in Manitowoc, Wisconsin. Maybe my new found passion will be the way I repurpose myself. If furniture can gain a new life with a coat of paint, why can't I? A trip to Barnes and Noble last weekend has revitalized me and helped to focus on my other passion. How you might ask? 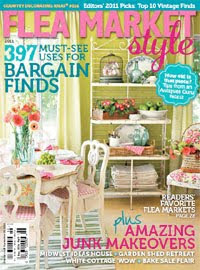 This little spot in the Latest edition of Flea Market Style. My mom and I were vendors at Viva's Vintage Market and I had so much fun, so I thought the entire world that is hooked on blogging and decorating with vintage finds should know about this lovely little show. I submitted a little entry after reading the Flea Market Style Bog, and now on page 29, my name is in print. Pick up a copy at your local bookstore. It's filled with great ideas. Technology enables us to have contact with so many more people. The possibilities are endless. So I am busy dreaming and planning what finds to bring to Viva's Vintage Market this year! Maybe these will be some of the special finds customers will find in Vintage Retouche at Viva's Vintage Market this year. Mark your calendars for the Saturday after July 4th for a trip to Sister Bay, Wisconsin to attend Viva's Vintage Market. Stop and see all of the great things I have in store for you.